We have a new website for the school to get the full and accurate information: www.yogiartschool.com. 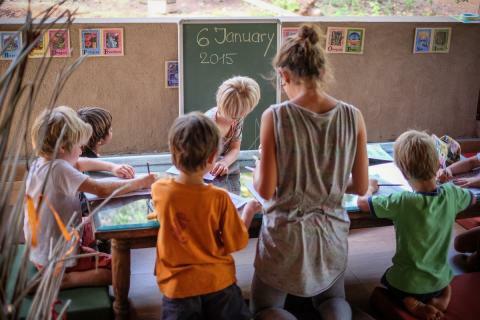 Our school for children ages 2 to 12 operates a 5 minute walk away from the Mango Tree Private Retreat. We are openly accepting volunteers and donations to help our school grow. Thanks for your support. YogiArt School has matured and grown, with nearly 50 students at its peak. We can safely say that it is the only proper school north of the Morjim Bridge. We know there are so many young families who do not want to get stuck in their country because of school, and we need all these families’ support to make this school a long-term reality. Samata’s Cashew Tree property has a lot of potential. There is one big Indonesian central hall, which will be converted into the main assembly room and classroom art center. We have 2 other structures which will be turned into classrooms, 5 communal bathrooms, a big area for the kids to run and play, and big shaded areas for outside activities even when the sun gets hot. We also have a small kitchen where lunch will be prepared, and we have clean running water from our well, which is filtered for drinking. An open-air campus of 6,000 square meters tucked in our great Temple Road neighborhood, the property backs up onto cashew hillsides for endless walks and wildlife adventures. Focusing on outside activities and making learning fun, we are excited to have such shining and special children blessing our space. 5 days a week will be a full curriculum of fun and creative interactive activities to enrich and inspire these young minds and to give them a safe and loving environment to build their social skills among their peers. 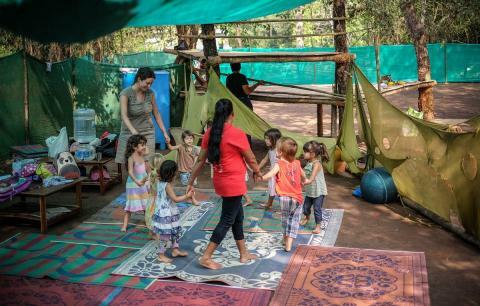 If you live in Goa during the season and have a child who would like to join our school, please contact us for more information at info@samatagoa.com. Through our educational process, we care about the holistic development of the child that unites heart-mind-body-speech-action. It is important for us to put equal attention in developing all these aspects of a child’s nature. Provide a safe and loving atmosphere of structure which provides clear boundaries and encourages the students to become self-disciplined. To help develop the children’s ability to act with gentleness, respect, fearlessness, and confidence in working with themselves and with others. Nurture a fundamental appreciation of the world as it is in all its richness. Nurture the students’ awareness, trust, and expression of their Fundamental Goodness.